Fees associated with filing a trademark application in Vietnam as well as other trademark fees are available in the fee calculator. The multiple-class trademark applications are possible in Vietnam. The applicant or trademark agent must prepare all the required documents before registering: a trademark application made in the prescribed form; proof of payment of the official fee; trademark samples and information identifying the mark as provided (usually prepared by the trademark agent). Filing documents for a trademark application in Vietnam must be submitted in Vietnamese. The POA must be submitted within one month from filing a trademark application in Vietnam. Notarization or legalisation is not required. The certified copy of the priority document should be translated into Vietnamese and may be provided within one month from the filing date. Substantive examination is carried out for the trademark applications in Vietnam. It defines the registrability or potential conflicts with other trademarks. The examination usually takes nine months from the publication date of an application. Vietnamese trademark application may be opposed at any time after the application publication date and before the issuance of the registration certificate. If neither oppositions nor objections arise, the decision to grant a trademark certificate will be issued and the official grant fee must be paid within three months from the date of that decision. The validity term of a trademark in Vietnam is ten years from the date of filing and can be renewed each time for ten years unlimitedly. To renew the validity of a trademark certificate, the trademark owner must file a request for renewal and pay the renewal fee within 6 months before the expiry of the preceding validity term. The trademark may be also renewed within six months after the renewal due date provided that a prescribed surcharge is paid. 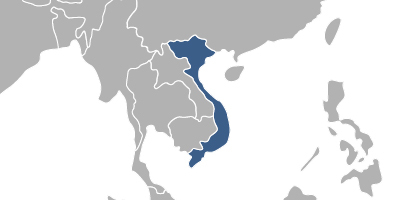 The trademark in Vietnam is subject to cancellation in case it has not been used within five years from its registration. It is required for the foreigners to perform the trademark prosecution in Vietnam through an agent, registered Vietnamese trademark attorney. Letters, words, drawings or images, including holograms, or a combination thereof, represented in one or more colours are registrable as a trademark in Vietnam. 1. Online Search Database for International Trademarks. 2. Registration of a trademark in Vietnam takes about 12 months, however, in reality, the process may be prolonged by 3-6 months depending on trademark office workload.